Brick Lane is known locally as Banglatown as it is the heart of London's Bangladeshi and Bengali communities. The street has been home to immigrants for hundreds of years including the French Huguenots, and later the Jewish community. This means you buy bagels on Brick Lane, as well as sample some of London's best curry houses. Brick Lane Market on Sunday mornings dates back to the Jewish community migration and sells everything from furniture to fruit and has become a cool place to hang out for the day. This part of London's east end has become trendy over the last few years and has a vibrant nightlife too. London's Brick Lane Market is a traditional flea-market with a wide array of goods on sale including vintage clothes, furniture, bric-a-brac, music, and so much more. The market is spread out along Brick Lane and spills out onto the side streets. At the bottom of Brick Lane, you'll find some wonderful fabric stores selling gorgeous Indian sari silks. Around the middle it gets very trendy around the Old Truman Brewery, then at the top, it's more junk and anything for sale. 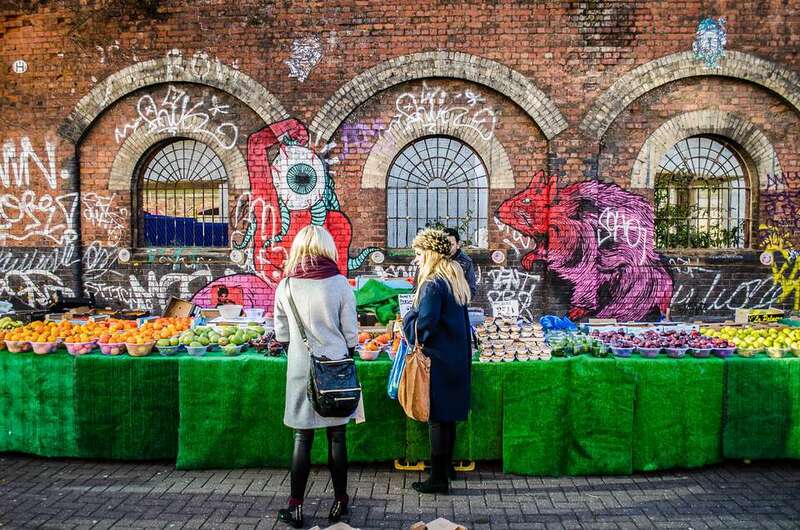 Allow plenty of time to see it all as the market stretches into Cheshire Street and Sclater Street. Sunday UpMarket is in the Old Truman Brewery on Brick Lane and sells fashion, accessories, crafts, interiors, and music. Opened in 2004, it has an excellent food area and is a hip place to hang out. Old Spitalfields Market is now a seriously cool place to shop. The market is surrounded by independent shops selling hand-made crafts, fashion, and gifts. The market is busiest on Sundays but is there Monday to Friday too. Shops open 7 days a week. Every Sunday, 8am-2pm, along this narrow cobbled street, you can find over 50 market stalls and 30 shops selling flowers, and gardening supplies. It's a truly colorful experience.